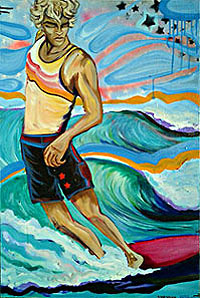 Shannon Payne McIntyre is a native San Diegan currently residing in Puerto Rico. 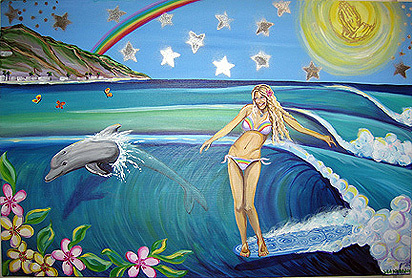 She is a momma, a surfer, artist, writer, surfboard shaper, filmer and host for "On Surfari". Shannon obtained her BA in studio arts from Pt. Loma Nazarene College; where she earned the nickname "Soul Cruiser," and has kept the mellow surf-seeking gypsy attitude towards life ever since. 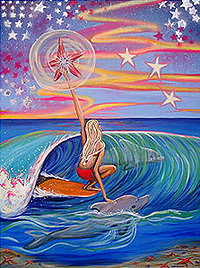 Shannon has donated her artwork to raise funds for the SurfRider Foundation, Red Cross, Orphanages, and has spoken at Schools, Churches, and Correctional facilities inspiring people that everyone has unique talents and purpose in life. 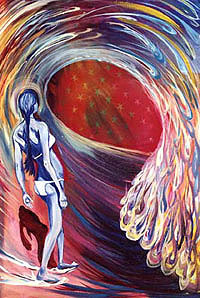 She has received notoriety for her creative efforts and travels in numerous publications including SURFER, Surfing, SG, Surf Life for Women, Surfer's Path, Surf Session France, Beach Girls Japan, Surf Trip Journal Japan, Tracks Oz, Surf Girl UK, Waves Girl Oz, Outside, Men's Journal, Dandelion, O2, Risen, Big, Cosmo, as well as several San Diego articles, web interviews, and TV appearances. 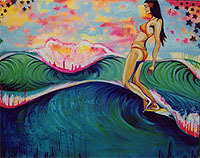 Many of Shannon's paintings are inspired by God, combined with her passions of surfing and travels throughout Asia, Indonesia, Polynesia, Melanesia, Australia, South and Central America, Caribbean, Europe, and the Middle East. I love making it look fun. I do my best to capture that moment in surfing where everything stands still and instant bliss overcomes you. These experiences are burned into my mind when all the colors of the water and surroundings are so intense, and my senses are overwhelmed by the taste of salt water, the sky, sounds of rushing water, joy, and pulsing adrenaline. It's in these times that I especially give thanks to God for all of Creation, allowing us to be creative, and to Jesus for teaching us to walk on water.